Suzuki Osamu is an important figure in the vanguard movement of Japanese ceramics. 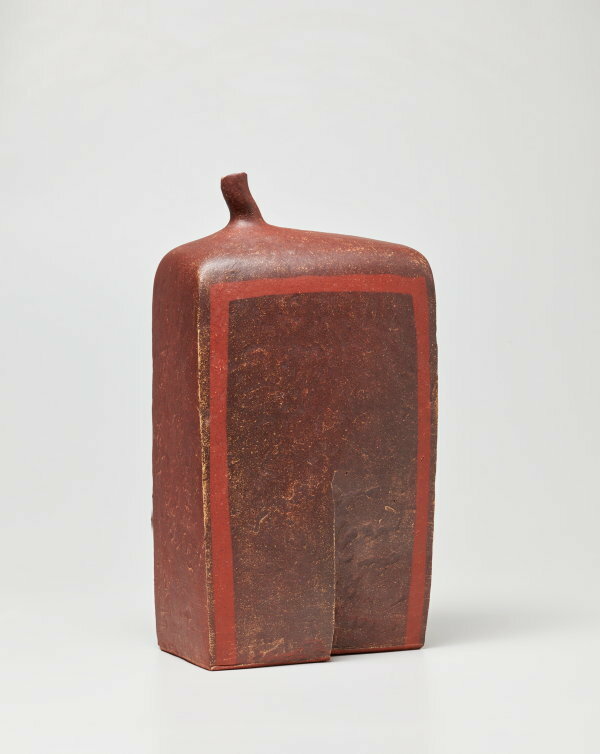 Born in Kyoto in 1926, he graduated in ceramics from the Kyoto Municipal Technological School in 1943. In 1947 he exhibited for the first time in the third 'Nitten' (Japan art exhibition). In 1948 he was one of the founders of the avant-garde 'Sodeisha' group, with whom he exhibited regularly. 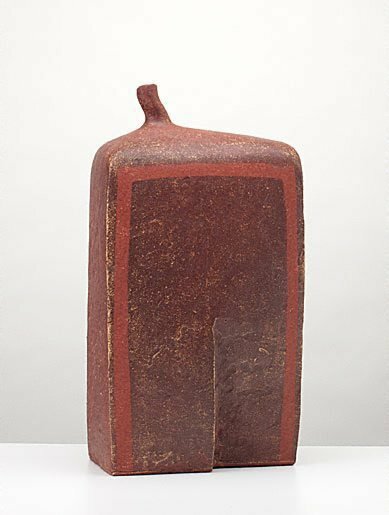 In 1949 he entered the competition of the 'Shinshôkai' (New Craftsman's Group), which was at the time headed by the potter Tomimoto Kenkichi, and won a prize for his piece. He participated in many exhibitions, both in Japan and overseas, and has been awarded many prizes. He became head of the Sodeisha group in 1979 following the death of Kazuo Yagi. For some years he was a judge for the Japan Traditional Crafts exhibitions. His work was included in the exhibition of the group that toured Australia in 1979-81. In much of his work, Suzuki has been inspired by the neolithic clay figures called 'dôgu', as well as by the slightly later 'haniwa' figures. While the source of his inspiration is these figures, he has abstracted his shapes and is concerned with exploring and disrupting the planes and textures of the surfaces of his objects. He works in celadon as well as with the plain clay body seen in this imposing, non-utilitarian ceramic sculpture. Signed back, in Japanese [stamped] "Su". Dated back [incised]. Signed back of lid [associated NWA box] in Japanese, ink [inscribed] "Suzuki Osamu [and artist's seal]". Not dated.